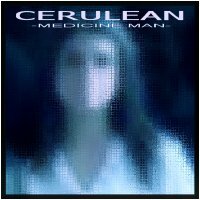 Cerulean is the chronicle of the Medicine Man's last year in school, opening with flashbacks to his difficult earlier years and then taking "a metaphysical vibe", resulting in the artist finally beginning to assert himself against the chaos around him. "When you listen to it, you will experience the struggle and experience the feeling of being taken to the edge of sanity, and winning the fight. Don't listen to this going to sleep; there's a lot of dark corners on here..."
Although there is indeed a good deal of dark ambient territory covered by this album, there is also a great deal of other territory as well, including some exceptional light ambient as well as more progressive forms. All told, this is a masterful debut on Earth Mantra for Medicine Man, and we hope it is not the last. Unbelievable imagery...you can loose yourself in this music (keep the light on).